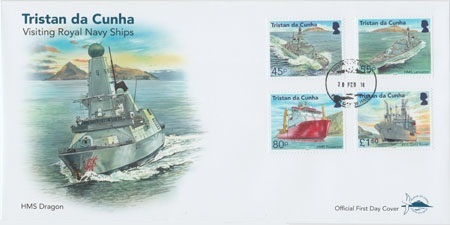 Stamps celebrating four of the Royal Navy ships that visit and provide support to Tristan da Cunha. 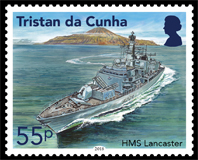 Tristan da Cunha has a close affinity to the military and in particular the Navy, from the founding of the British community nearly 200 years ago, to the present day. 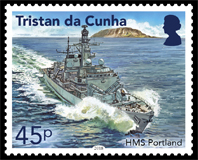 As the world's most remote inhabited island, visiting naval ships have always been a welcome sight and have provided much needed support for those living on Tristan da Cunha. With a population of just 254 islanders (January 2018) resident on Tristan the arrival of a ship's crew can almost double the local population and is often a time of great excitement and celebration. HMS Portland arrived off Tristan 14 January 2017 from South Georgia and anchored offshore. The small harbour was too small for her, but personnel were ferried to the island the following day, once the Harbour Master had assessed the swell and confirmed that it was a suitable day. She had carried out a fishery protection patrol of Tristan's waters – the sea is rich with crawfish, one of the island's main sources of income – before dropping anchor for 24 hours in company with tanker RFA Gold Rover. As always, the short visit assured islanders that the mother country had not forgotten about them, and allowed the sailors the rare chance to enjoy an island few people set foot on. HMS Lancaster (F229) is the 4th Type 23 frigate in the Duke class. 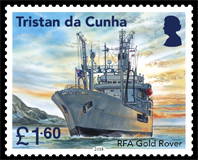 In August 2015 she visited Tristan together with RFA Gold Rover, and they were able to help the islanders carry out two years' work in just a few days. The visit was exceptionally busy for both vessels, especially for Lancaster's Wildcat helicopter and crew, who flew essential stores around the island to remote areas. In total both ships helped islanders lift and shift equipment and supplies that would have taken two years of manual work. The island's Administrator, Alex Mitham, thanked both ships for the reassurance that their presence brought and highlighted his admiration for what was achieved in such a short time. HMS Protector, the Royal Navy ice patrol ship, visited Tristan 14 March 2017 on her route to the Falklands and Antarctica. She visited to conduct the first systematic survey of the British Overseas Territory since the 1970s. Although the 1961 volcanic eruption had only marginally affected Edinburgh, it badly affected the waters surrounding the settlement, leaving them particularly hazardous for navigation and in need of surveying. In the first survey of the area to be conducted using modern techniques, HMS Protector used her motorboat James Caird IV and onboard systems to make a multi-beam echo sounder survey of the Edinburgh Anchorages. 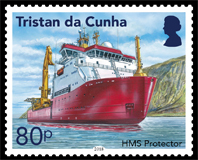 Captain Peter Sparkes, HMS Protector's Commanding Officer said: "It is a genuine pleasure and privilege for HMS Protector and the Royal Navy to be able to help in making the waters around Tristan da Cunha safer for all seafarers; we are delighted to be here." RFA Gold Rover was the last of five Rover-class ships built for the Royal Fleet Auxiliary in the late 1960s/early 1970s. In recent times, the Rovers have spent the bulk of their time south of the Equator, providing fuel for Royal Navy vessels on patrol in the South Atlantic. RFA Gold Rover visited Tristan many times over the years she was in service, including a visit with HMS Southampton 30 October 2007, and a visit 16 December 2007 having been tasked to urgently resupply drugs and medical stores to the island. 271 members of the island's population had suffered a viral infection, which depleted stocks to a dangerous level. After several other visits, her arrival with HMS Portland in 2017 was to be her last. As the oldest vessel in Naval Service, she was due to be decommissioned the following month, 43 years after first pumping oil into the tanks of a Royal Navy warship. HMS Dragon (FDC) is the fourth ship of the Type 45 or Daring-class air-defence destroyers built for the Royal Navy. She visited Tristan 30 January 2015, more than a year after their last visitor, HMS Richmond in 2013. As the small harbour was unable to accommodate an 8,500-tonne warship, the Portsmouth-based destroyer used her sea boats and Lynx helicopter to ferry personnel and supplies from ship to shore. The visit may only have lasted 24 hours but during that time the Lynx lifted numerous fence posts to otherwise inaccessible parts of the dormant volcanic island to help keep cattle from straying, and conducted patrols for illegal fishing. This was the second-ever deployment for the warship. To mark the occasion, the fiercely-named Type 45 destroyer had a red dragon painted onto her bow, just as she did for her first ever entry to Portsmouth in 2011.